Everything you need for bank compliant mobile check printing on-demand! Print high-quality bank compliant checks, photos, images, barcodes and other security information - anywhere, anytime! 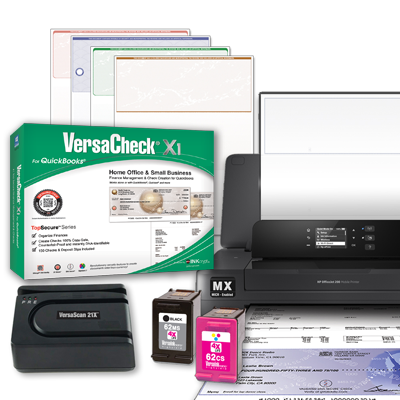 Includes Mobile MICR printer, MICR check compliance scanner, check printing software and blank check paper in one low cost bundle! 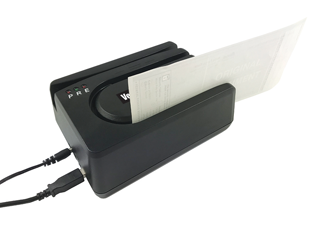 The Mobile Print Studio VS 200 is a portable printing system that lets you print full color checks and documents with bank compliant Magnetic Ink Character Recognition (MICR) ink. The durable, compact HP 200MX printer fits in your car, laptop bag, and more, for convenient wireless or wired printing anywhere. The included battery is long lasting and can be recharged in your car or office. Easy-to-use, this printer saves you 50-80% or more vs. buying pre-printed checks from banks and mail-order suppliers. 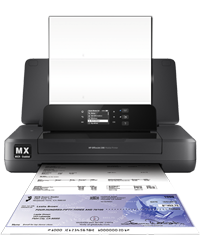 And the 200MX is equally able to handle all your everyday document and photo printing. This system includes VersaCheck® X1 2018 for QuickBooks® software to begin printing checks right away. Test readability of MICR encoded checks and documents at anytime. The VersaScan 21X is easy-to-use, just insert check and view the light indicator. (green=pass, red=fail). Ensures your checks were set up and printed properly (MICR bank code line positioning and bank data formatting). 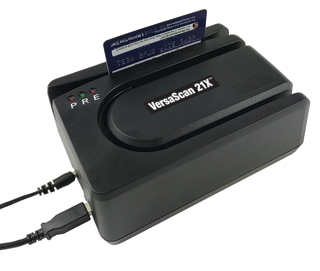 The VersaScan 21 also tests for sufficient magnetic signal strength so your checks will be readable by banks and retail outlets and compliant with new "Check 21" federal law. You can also capture credit card information with the build in magnetic stripe reader. Insurance agents can print checks and high quality business documents on-demand. Claim adjusters can even settle claims on the road by utilizing the HP 200MX portability and VersaInk's bank-compliance capabilities. Process paychecks on the road for mobile workers such as painters, gardeners, electricians, and realtors. Print checks and documents where you do business, even when your location constantly changes! Compact and portable - print from your laptop or mobile devices wirelessly, with or without a router. Use VersaCheck® X1 2018 for QuickBooks® to instantly print checks and calculate and store check transaction data while on the road. Note: Scanner color and appearance subject to change without notice. 1Additional Print Credits (Validation Codes) included free with VersaCheck, VersaInk & VersaToner supplies or for purchase separately in the Validation Codes section of VersaCheck.com.